During a recent poetry reading in Missoula, a Vietnam combat veteran reminded his audience that he and other veterans returned not to waves of gratitude, but to a line of protesters calling for peace. By its nature, standing a line is combative. Any statement for something is also a statement against something. 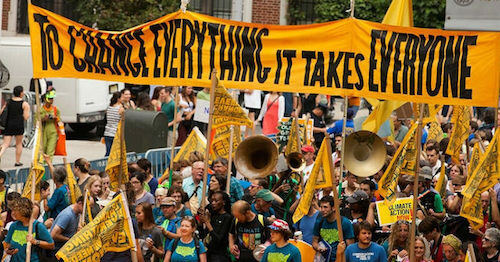 On the heals now of the largest climate march to date, 310,000 people gathered in the streets of New York City September 21, 2014, we begin a wave of actions with the potential to change the global course from disaster to harmony. Unless all of us work together, this wave will not continue to flow and disharmony will reveal itself as the prevailing chord. As I think of this Vietnam veteran and my own father who served as a surgeon in that war, I, too, consider men who have spent the majority of their lives building businesses in an air of cut-throat competition, my son’s paternal grandfather included. I want compassion for all of them. Man, each in his own way, has slaved to provide for many while protecting those he knows and loves. Violation is, on every level, in discordance with the soul. If anyone is a slave in a system, everyone in that system is a slave. It does not matter if you close your day having earned a million dollars or 10. To spend one’s time working at anything other than what uplifts the soul is to live a diminished life. Not one of us is immune to the price we pay for how things have been working for generations passed. We have inherited competition and an emphasis on material wealth, absent of reverence for ourselves and one another. It is beautiful to have material wealth. Enough of us know from experience that beyond a certain point of basic needs being met, material wealth in itself does not serve for true contentment. It is up to us to change a system of acquisition grounded in fear of scarcity. We will do so solely by way of unconditional love and compassion. To move forward honestly, in peace from where we are now, is to greet men of extractive industry and combat with the honor and recognition they deserve. They have served. There has been cost and benefit from the industrial and technological revolutions, as there have been costs and benefits of war. Who could have realized how much harm could actually be accomplished through fierce competition when this began? The world was so vast and limitless then. No one in business or government sets out with intention to cause harm. No one wants to destroy in order to get what they want, though we will if those are the rules of the game. With each thought, word and deed, we each and all play a role in changing the rules of the game or maintaining rules that brought us to this edge of societal and biological collapse. To be competitive in today’s business is to place many lines at the bottom. The shift is naturally commanded by the sheer number of humans who now labor without attainment of their basic needs, coupled with the exhaustion of the ecological communities in which we participate and on which we depend. If we can wrap our minds around the reality that the next mass extinction is happening now and is set on course to change the world as we have known it thus far, there is the possibility for peace. The highest aspiration, peace on Earth with goodwill toward all, will be accomplished through the embodiment of peace and goodwill in each and every person. Combative language does not serve to move us forward. Blaming and shaming one another is where we have been. The cost of judgment proves to be a looming loss of everything we and our ancestors strived to build and all we adore. Will we honor the sacrifices? There have been so many. The pain is immense. The pain is ours, something we share. Will we recognize that everyone has made and continues to make sacrifices of the soul under the competitive paradigm? Let us begin today with compassion toward ourselves and one another, trusting that as we serve others, we, too, will have everything we need and more. There is no one to blame and there is no time left to continue pointing fingers. The UN Climate Summit in New York City opened September 23, 2014 with a stunning short film on what is possible when we commit solely to unconditional love, allowing and trusting the unknown benevolent future that flows from that present. May the most challenging discussions, private and public, commence with an air of gratitude and appreciation for all who have served in the interest of universal peace and prosperity. 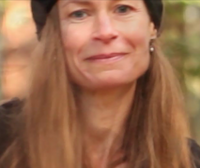 Megan Hollingsworth, MS, is a mother, writer, and compassion activist. She is founder and creative director at ex•tinc•tion wit•ness, a collaborative art project. Connect with Megan by visiting her website, or you can follow her on Twitter, Facebook and Vimeo.